Repainting your Ultra's tank? Our easy-to-install graphic kit matches closely to the factory tank graphic as shown in the image. 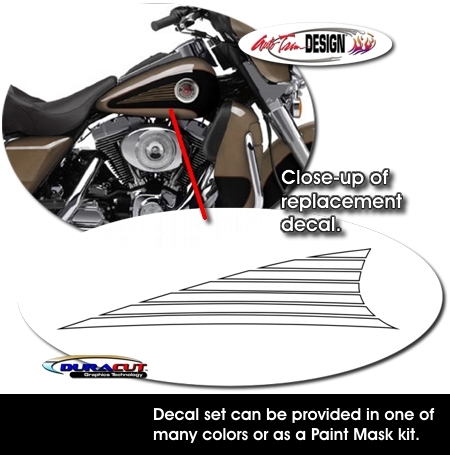 The graphic kit comes packaged with two (2) graphics (one  for each side of the tank) and is available in a wide variety of colors or simply as a Paint Mask kit. Kit DOES NOT include pinstriping found elsewhere on the tank - it only includes design as shown. If your tank looks like the one in the image, this kit will fit. Easy to follow general online application and care instructions are included.